REquipment will assign 1 piece of equipment per person per year in the following categories: power wheelchairs, manual wheelchairs, scooters. Some items are reserved for certain geographic locations. These items are noted in the comment section of the device description. REquipment consumers are responsible for learning to use REquipment DME properly and acquiring related manuals and operating instructions if these are not provided. Consumers understand that REquipment DME must be accepted "as is," that it has not been evaluated by a licensed technician, and that it is no longer covered under a manufacturer warranty. REquipment consumers are given the opportunity to inspect REquipment DME prior to accepting it. Acceptance of REquipment DME requires signing a release form in which consumers assume all responsibility for REquipment DME, including any problems encountered while using their device(s). REquipment consumers are responsible for any future maintenance and repairs of the donated DME. REquipment items are not on loan; consumers can keep the equipment as long as needed. 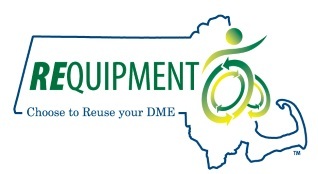 REquipment consumers agree to contact the REquipment program should they no longer need the DME so that it may be returned as a new donation (subject to all program policies current at the time of consideration).